If you are interested in developing your psychic abilities, there are many things you can do. Some are more complicated than others and require partners. The following are two simple exercises you can do on your own to help you get a feel for how you receive psychic information. They require only a regular deck of playing cards. For the first exercise, take the deck of 52 playing cards and set the deck face down in front of you. Draw one card, but don’t look at it. Set it down in front of you face down. Your intention in this exercise is to intuit whether the card is red or black. You have a 50-50 chance of guessing correctly, though the idea here is not to guess but to intuit. If you are aware of how you receive psychic information, then pay attention to that psychic channel (though don’t ignore the others) and determine whether the card is red or black. If you don’t yet know how you receive your psychic information, you may want to read up on it a little. The article Psychic Communication: Receiving Messages from Guides and Angels discusses the four different forms of psychic communication and how to recognize them. When you have made your final decision as to whether the card is red or black, turn the card over to see if you are correct. If you are correct, place the card face down on your right, forming a pile of correctly guessed cards. If you are incorrect, place the card to your left, face down, forming a pile for incorrectly guessed cards. Continue until you have gone through the entire deck of cards. Since there are 52 cards in the deck and you have a 50-50 chance of guessing each card correctly, if it were just random chance, you would have about 26 cards in the pile representing your correct guesses. There would perhaps be more or less in the pile, but you should guess correctly about half the time if you are simply guessing. Anything significantly higher than that would indicate something other than chance at work. If you are finding success with the above exercise or would just like something a little more challenging, then try intuiting the suit of the card. Shuffle the cards and set the pile in front of you, face down, as described above. Select the card from the top of the pile and set it down in front of you, face down. 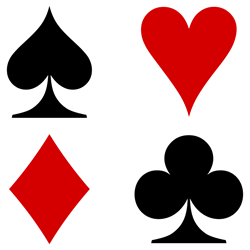 Use your intuition to determine if the card is a heart, club, spade, or diamond. When you are sure of your answer, turn the card over and set it in the appropriate pile. With a one in four chance of being correct, you would be able to guess correctly on about 13 of the cards using random guessing. If you are doing much better than that, then it indicates something other than chance at work. Try to notice what was different when you guessed correctly as opposed to when you were not correct. Was there a different feel to the correct guesses? Were you in a more meditative state when you were guessing correctly? Keep a journal and if you practice regularly, you will be able to track your progress. These exercises are for fun and can be a simple way to practice building your psychic intuition.